Ryan works with the youth at our church which means he is gone on Wednesday nights, it also means our Wednesday night dinners tend to be on the easy side. Occasionally we like to have breakfast for dinner to change things up a bit. Tonight I cracked open The New Best Recipe Cookbook and we tried out the Light and Fluffy Pancakes. They were really good, easy to make and just like the name.. light and fluffy. 1. Whisk the lemon juice and milk together in a medium bowl or large measuring cup; set aside to thicken while preparing the other ingredients. Whisk the dry ingredients in a medium bowl to combine. 2. Whisk the egg and melted butter into the milk until combined. make a well in the center of the dry ingredients in the bowl; pour in the milk mixture and whisk very gently until just combined (a few lumps should remain). Do not overmix. 3. Heat a 12-inch skillet over medium heat for 3-5 minutes, add 1 t oil and brush to coat the skillet bottom evenly. Pour 1/4 c batter onto 3 spots on the skillet. 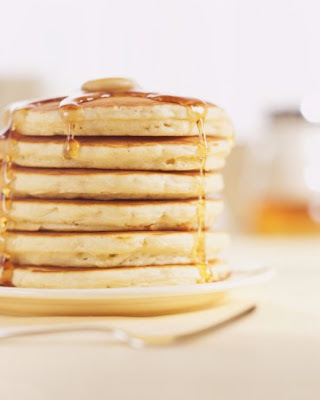 Cook the pancakes until large bubbles begin to appear, 1 1/2 to 2 minutes. Flip and cook until golden brown on the second side. Serve immediately. If you don't have this cookbook. It's definitely worth the $$. Every recipe I have ever tried has been excellent.